The architecture of the Maryland Institute, College of Art’s buildings reflect the college’s broad appeal to artistic students. MICA’s cluster of buildings range from a classic 1825 main administration building, to a former train station now used for painting and textile classes, to an ultra-modern classroom, lecture and gallery building wrapped in glass. 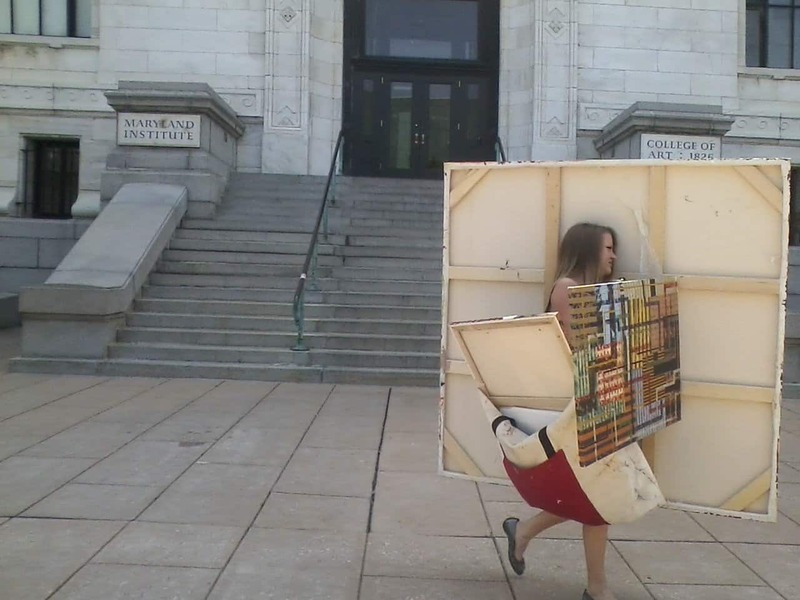 A MICA student carries her painting out of the main building, which was constructed in the 1890’s. While MICA students can specialize in several different visual arts fields, they are all required to take a variety of liberal arts and humanities courses. All first-year students take the same courses, known as Foundation year, which includes an intense introduction to a spectrum of arts-related topics (see the Foundation course list here). Students can specialize in animation, graphic design, sound recording, book design, illustration, textiles, metal work and many other artistic areas. New majors include art history and humanistic studies, and new minors include creative writing and gender studies. While students are talented and definitely hone their craft here, MICA trains students to think critically, present individual and group work, and look for solutions, preparing them for careers in many fields. With about 1800 undergrads all working towards BFA degrees, MICA has doubled in size in the past 13 years. MICA’s campus is bustling and all of the students I saw looked happy and connected. Incorporated into the Mount Royal community of Baltimore, MICA is minutes from the train station and light-rail adjacent.